2 art prints : col.
Fonds is arranged in series. The Ecclesiastical Province of Ontario was incorporated in 1911. It is one of the four provinces comprising the Anglican Church of Canada (ACC). The other ecclesiastical provinces are Canada (founded 1860), Rupert’s Land (founded 1875), and British Columbia and Yukon (founded 1914). In the structure of the ACC, the Ecclesiastical Provinces make up the organizational level for the Church below that of the General Synod. Each Ecclesiastical Province, headed by a metropolitan or archbishop, is organized into one or more dioceses, each headed by a bishop. Historically, the Ecclesiastical Province of Ontario was first organized in 1860. 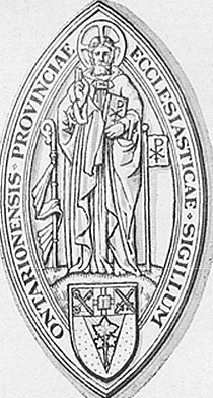 After the General Synod for the then Church of England in Canada was formed, the province was officially organized in 1911 under Canon VIII titled “On Erection of an Ecclesiastical Province for the Civil Province of Ontario”. The first Provincial Synod meeting was held on October 18, 1912. There are seven dioceses in the Ecclesiastical Province of Ontario. In the order they were founded they are: Toronto (1839), Huron (1857), Ontario (1862), Moosonee (1872), Algoma (1873), Niagara (1875), and the Diocese of Ottawa (1896). Except for the Diocese of Moosonee, which use to be part of the Ecclesiastical Province of Rupert's Land, the dioceses in the Province of Ontario were part of the original Diocese of Toronto. Each year the Eccesiastical Province meets in a Provincial Synod headed by the Metropolitan. Metropolitians before 1912: Charles Hamilton (Bishop of Ottawa, 1860-1868), Ashton Oxenden (Bishop of Montreal,1869-1878), John Medley (Bishop of Fredericton, 1879-1892), John Travers Lewis (Bishop of Ontario, 1893-1900), William Bennett Bond (Bishop of Montreal, 1901-1906), Arthur Sweatman (Bishop of Toronto, 1907-1909) and Charles Hamilton (Bishop of Ottawa, 1909-1912). Metropolitans of Ontario after 1912: Charles Hamilton (Bishop of Ottawa, 1912-1915), George Thorneloe (Bishop of Algoma, 1915-1926), David Williams (Bishop of Huron, 1926-1931), James Fielding Sweeny (Bishop of Toronto, 1932-1932), John Charles Roper (Bishop of Ottawa, 1933-1939), John George Anderson (Bishop of Moosonee, 1940-1943), Charles Allan Seager (Bishop of Huron, 1944-1948), John Lyons (Bishop of Ontario, 1949-1952), Robert John Renison (Bishop of Moosonee, 1952-1954), William Lockridge Wright (Bishop of Algoma, 1955-1974), James Augustus Watton (Bishop of Moosonee, 1974-1979), Lewis Garnsworthy (Bishop of Toronto, 1979-1985), John Bothwell (Bishop of Niagara, 1985-1991), E. K. Lackey (Bishop of Ottawa, 1991-1993), Percy O’Driscoll (Bishop of Huron, 1993-2001), Terence Finlay (Bishop of Toronto, 2001-2004), Caleb Lawrence (Bishop of Moosonee, 2004-2009), and Colin Johnson (Bishop of Toronto, 2009-). Fond comprises the following records documenting the activities and functions of the Ecclesiastical Province of Ontario's Synod, Provincial Executive Council, the Clerical Secretary, the Registrar, the Treasurer, the Public Education Working Group, the Commission on Theological Education, the Metropolitan, the House of Bishops, Provincial Administration and Planning Board/Commission, Ministries Commission, Primate's World Relief Development Fund, Partners-in-Ministry/Partners-in-Mission for Education, Synod Programme Commission and other committees struck by the Ecclesiastical Province of Ontario. Fonds also comprises records documenting the Province's inter-faith and legislative activities. Includes: Minutes of meetings, reports made by and to the Provincial Executive Council, as well as other records documenting the activities and functions of the council; correspondence, reports made by and to the Clerical Secretary (1912-1950) or the Registrar (1922-1973) and other materials, documenting their activities; minutes, correspondence, reports made by and to the Public Education Working Group and other materials, documenting their activities and relating to religion in the schools of Ontario with particular focus on funding for Roman Catholic separate schools, the place of religion in the public school system, and the removal of the Lord's Prayer from the public schools in Ontario; minutes, correspondence, surveys, and reports made by and to the Commission on Theological Education and other materials documenting their activities and relating to theological education, Anglican theological training colleges, consultations on ministry, and other training for the ministry; the provincial Act of Incorporation, consitutions, and canons, and other materials related to the governance of the Ecclesiastical Province of Ontario; deeds of consecration, notices of election, orders of service; acts, papers and correspondence of the Metropolitan, and the minutes, reports and other materials documenting the House of Bishops of the Ecclesiastical Province of Ontario; minutes of meetings, reports and other materials documenting the activities of the Provincial Administration and Planning Board/Commission, Ministries Commission, Primate's World Relief Development Fund, Partners-in-Ministry/Partners-in-Mission for Education, Synod Programme Commission and other committees struck by the Ecclesiastical Province of Ontario; minutes of meetings, reports and other materials documenting the interfaith activities of the Ecclesiastical Province of Ontario, including participation in the P.L.U.R.A. inter-church association to promote social justice in Canada and I.S.A.R.C., the inter-faith social assistance review coaltion; correspondence, disbursements, cash books, account statements, audit files and reports, ledgers, committee expenses, assessments and apportionments by diocese and other materials. Also, includes correspondence concerning the archives of the province. May be restrictions on access and use based on the terms of the Deposit Agreement and the Anglican Church of Canada's policy on Privacy and Archives. Subject to established university policies and to applicable privacy legislation.